After spending my first week of retirement at home, Diane and I left for San Francisco. She was attending a nursing conference and I was sightseeing. A perfect combination. I spent some of the time hanging out with Meredith and otherwise I hiked to such places as Coyt Towers and the Marina district. Hiking up to Coyt Towers was very cool. I treked up there from Levy Plaza, which meant going up about 450 steps on Telegraph Hill. On the way I saw some of the parrots on which the movie "The Parrots of Telegraph Hill" was based on. They were a noisy bunch! One day, Meredith and I met up at the Metro and went to the Academy of Science Museum. It has a wonderful aquarium with a Philippine coral reef formation with fish life and another one in a California coastal setting with typical fish life. Meredith had prepared a delici ousIndonesian styled lunch with brown rice, tofu, vegetables and a peanut sauce. For dessert we had some cut-up fruit. Very yummy. On one of the evenings a software vendor at the conference treated customers to a home game of the San Francisco Giants. I wasn't really thrilled with the idea, but it turned out to be a lot of fun. Elliot helped out a lot by explaining the nuances of the plays and what was really going on. The Giants won. It was a good night. only locally grown organic food with a French flair. 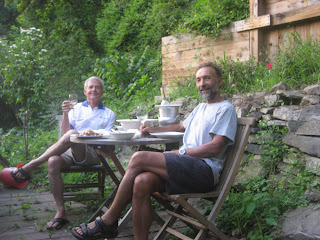 We went to the cafe side of the house and shared a few meticulously prepared meals and dessert. A good choice. 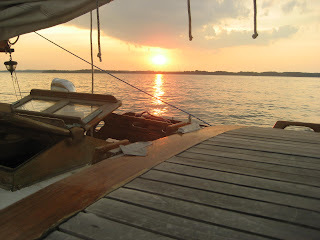 The next day, I flew out to Philadelphia to go sailing on the Chesapeake Bay. Diane drove back home. My friend Wes was at the airport and we drove to his home in Port Deposit. 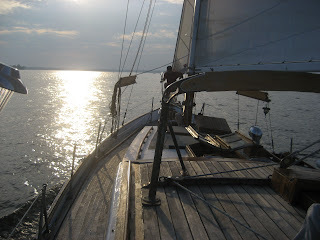 The following day, we got up and after picking up food supplies (and beer/wine), we boarded the Belle Helene (his CT-41 ketch) and soon we were off on our annual sojourn. Our ports of call this trip were Annapolis, Knapp's Narrows, Hooper Island, Smith Island, and Galesville. 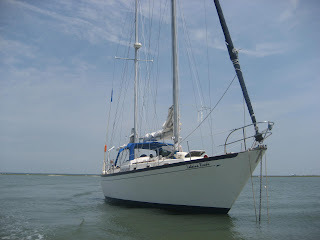 We ran aground once coming into Hooper Island and once trying to maneuver up the narrow channel of Smith Island. But both times, we got off relatively easy. We gave up trying to get into the Smith Island harbor because it was low tide and we had too much draft. Too bad, we had really looked forward to visiting the island and meeting the locals. Apparently the original families have been there since the 1600's and make their living as watermen, crabbing and fishing, and speak with an unusual accent. One of the more unexpected things we saw was large schools of dolphins and a number of brown pelicans. What was also fun to see was osprays (the sea eagles) at many harbor entrances. They build large nests out of twigs on top of harbor pilons and markers. During this time of the year, their eggs are hatching and sometimes we'd catch sight of the baby birds squawking for food. The weather was pretty much across the board. We had warm and sunny days, cooler and cloudy days, and one very wet and nasty day with lighting and thunder around us. For the most part, the wind was on the nose wherever we went. Hhmmm....strange. The rest of the voyage was relatively uneventful, with the exception that the auto-pilot decided to quit working and the engine began to heat up a bit and losing water. That required Wes to feed it a few cups of water about every ten minutes. I steered. But hey, no voyage is complete unless something fails. But the food, beer, wine and crew all worked flawlessly. After getting back to the house, we had a well deserved shower (our first in a week), and quite the dinner. With some legumes harvested from his garden Wes added shrimps, artichoke hearts, shallocks and tomatoes. For appertif we had snails in a butter and garlic sauce. Wow what a spectacular meal. The next day, I jumped on the local Maryland train (MARC) to Washington, DC. There I spent a fabulous day walking around our nation's capital. I walked pass the Capitol building and thought about all those fat cats in there in charge of our future, went in to check out the Reading Room at the Library of Congress and a presentation they had on the Constitution. I also visited the American Indian Museum, the National Arboretum and a bit of the National Museum of Art. All in all, a pretty good day. At 4pm I met up with my friend, Colleen, who works at the Dept of Energy. We hadn't seen each other in more than ten years, so it was fun to catch up on things. We ended up eating at a quaint little Thai restaurant just outside of the District. We had decided to sit outside, when the weather took a sudden turn for the worse. It proceeded to give us a lighting show, with thunder and lots of rain. Next, I was off to see my friend Dave, in Charleston, SC. Dave picked me up sporting a new long pony tail and board shorts. He looked a little different from his days as school superintendent. In fact, he looked more like I remember him from college - just a little grayer! We drove to the Ashley Marina on the Ashley River where he kept his boat. His Whitby 42 is an 1980's boat but it's in real good shape. Nice layout below, with an aft cabin, a walkway in between to the main salon, nav station, two heads, V-berth and galley. The following day we worked on reefing setups for the main and did some marine hardware shopping, as well as food supplies. We installed a newly insulated backstay and some other odds and ends. The following day we were on our way to take Lahaina Roads for her maiden sail - Dave had not sailed her yet! It turned out to be a fabulous sailing day. We headed out of the Charleston channel with little hope of finding descent wind conditions. But what we got was a steady southern breeze that yielded a close reach out and a beam reach back. The boat performed very well, at times, exceeding speeds of 8 knots. On the way back instead of going back to the marina we went up the famed Inter Coastal Waterway. We got to our first bridge and radiod ahead that we would like passage through. The bridge operator radiod back to stand-by. Soon the bridge began to open. We were heading to the right side of the opening, when the bridge's Nazi lady snapped on the VHF "Left side - always the left side." We quickly oblidged and throteled through it on the left side and thanked her. It was several miles to our anchorage near Dewee Island and some marshes. Fortunately the tide was coming in so we got an extra 1-2 knotts out of it. Along the way, there were some houses, small marinas, and more marshes. We arrived at the anchorage near sun down and anchored in about 25 feet of water. It was a very peaceful setting and we were ready for beer. Dave and I were in agreement that we had had an excellent sail and the boat had performed well. Rain, lightning and thunder made its daily rounds in Charleston, generally in the latter part of the afternoon. One evening we really had a nasty front come through. The horizon was a mixture of onorous looking colors of deep red to dark gray cummulus clouds. For a while it seemed like a tornado might develop. It did rain heavily as the wind piped up. But thankfully no tornado made its appearance. On one of the days, we decided to go on a road trip north to Murrel's Inlet to visit a friend of his, Barry, who was anchored nearby. We first stopped at McClellanville, an old fishing village with shrimp boats and beautiful oaks and cypress trees. Then on to Georgetown, a town dating back to the late 1600's. 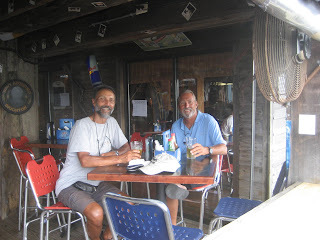 There we had lunch at a small bar overlooking one of the waterways, where several yachts were anchored. Pleasant enough, but while we were there, we had a major downpour. Lunch was something they called "low country boil", a mixture of shrimp, sausage, potatoes, onions and bell peppers. Pretty tasty. Dave has been adding lots of gear to the boat. He replaced the headsail with a brand new 135% heavy genoa with roller reefing, replaced the main and mizzen covers with a bag and lazzy jacks such that the sails simply fall into the bag, making it a lot easier to douse the sails.He's also installing a new GPS, new forward head, Monitor windvane. On the last day, we turned the boat around in the slip facing the boat's stern into the dock. That way, later on he could more easily install the windvane. That was not an easy task. Typical of full keel boats, Lahaina Roads does not behave well when backing down. Together with the wind and a lack of room, we had to try several times before making it back into to the slip properly. But we finally got Lahaina Roads settled stern in. On Thursday I boarded a plane to Charlotte and then Baltimore (BWI). On approaching Baltimore, though, we were diverted to Dulles Int'l due to bad weather. We sat on the tarmac for a while, took on some more fuel and eventually proceeded to BWI. Upon arriving, it was an easy shuttle to the MARC train, good connection time and off I was to Perryville where, again, Wes picked me up. The last couple of days at Wes' have been used up by email, preparing for Europe and seeing a little bit more of the neighboring area. We went to Rehoboth Beach and Lewes, which are in Delaware. Wes wanted to show me a more typical beach setting on the East Coast. Rehoboth has a nice, long boardwalk of which some is almost European in looks. But much of it looks more like a carni setting, interspersed with bars and hot dog stands. I still miss "Liahona II" now named "Lahaina Roads" as she became part of the family and she took good care of us. I was the navigator and the skipper had to steer where I told him to go (all the way from Kingston Ontario to Long Island Exumas.) The BBA chart I found unreliable as the meridians are not accurate so I got the Explorer Charts which made navigating a breeze. Then we up-dated with the Captain's Charts on the computer. But I always prefered to SEE where Liahona was going; standing at her bow. A great feeling! She is, by far, the BEST cruising ketch ever made with 2 extra layers of fbg in her hull. She does roll a bit but anything is better than a fin-keel. She sails, fully balanced, with jib and mizzen, although you get but half a knot from the latter. Fair winds and good luck!